Where to find Ingersoll hotels near an airport? 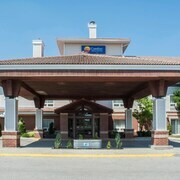 Where can I find hotels in Ingersoll that are near tourist attractions? For those visitors looking for hotels near Ingersoll, there are a number of options. You'll find 2 Expedia-listed hotels located within a 0.1-kilometre (0.06-mile) distance of the town center. If you are after a hotel within easy walking distance of the Ingersoll city center, Elm Hurst Inn & Spa and Comfort Inn and Suites Ingersoll are ideal. 30 kilometres (20 miles) away from the main part of Ingersoll, is the Westover Inn - An Ontario's Finest Inn. Alternatively, the Stone Willow Inn is 30 kilometres (19 miles) away. Other Expedia-listed hotels include the Holiday Inn Express Hotel & Suites Woodstock South and the Quality Hotel and Suites Woodstock. Looking to go a little further afield? Southern Ontario has a number of options. Southern Ontario is marked by beaches and coastal plains. Commonly visited Southern Ontario tourist destinations include traditional villages, churches and art museums. Popular things to do in this part of Canada include skiing, cross-country skiing and snow shoeing. The nearest places to stay in London include St. Thomas and Woodstock. St. Thomas is 40 kilometres (24 miles) to the southwest of Ingersoll, while Woodstock is 15 kilometres (9 miles) to the northeast. Hotels in St. Thomas are the Comfort Inn St Thomas and Sunnybrook Farm Garden-level Guest Suite. While Woodstock accommodation options are the Best Western Plus Woodstock Inn & Suites and Econo Lodge Woodstock. Just because you're on vacation, doesn't mean you can't enjoy your love of all things sport. Mohawk Racetrack is 90 kilometres (55 miles) to the northeast of Ingersoll. Sports fans wishing to find a room or apartment close by can choose from the Mohawk Inn and Conference Centre or the Toronto West KOA. London International Airport is a convenient airport, and is 20 kilometres (13 miles) away from Ingersoll. 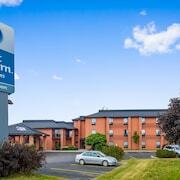 Accommodation options nearby are Knights Inn London Airport and Maple Glen Motel. 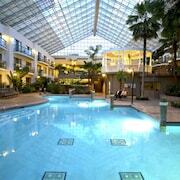 What are the most popular Ingersoll hotels? Are there hotels in other cities near Ingersoll? What other types of accommodations are available in Ingersoll? 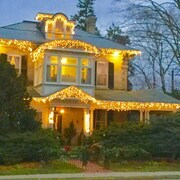 Explore Ingersoll with Expedia.ca’s Travel Guides to find the best flights, cars, holiday packages and more!